People often have one of two views about counselling and the benefits that it can bring to people. Either they are strongly against counselling and believe people don’t need it, or they are open to the idea of counselling and the benefits that it can bring to people. More often than not, people who are against counselling have never found themselves in a position where they have needed the help and advice (or simply the ear) of someone who is fully trained in Counselling. So, they struggle to understand the benefits of counselling therapy. It has been proven again and again through various studies that counselling therapy really does help and can be a very effective alternative to medical treatments. Whether it’s general counselling, cognitive behavioural therapy, emotional freedom technique or psychiatry that interests you, the route into a career within your chosen field can be baffling. There are so many different areas and specialisms you can opt to study and offer once qualified, that the process of beginning a career within the field can become overwhelming and daunting. Firstly, you need to decide what aspect of counselling therapy that appeals to you most and that you feel would be the most rewarding for you. If how someone’s brain works and the science behind it doesn’t appeal to you in the least, there is no point in setting out on a career in psychiatry or psychology. 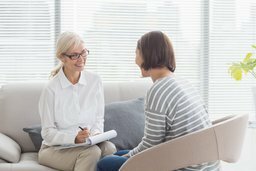 You would be better off looking into qualifications relating to counselling or emotional freedom techniques, where the focus is more on helping the person work through their fears and/or issues. Once you have established your area of interest, the next step is to find out what qualifications are needed and more about the Governing Bodies. A simple internet search will often provide you with plenty of information and advice, but be careful to ensure you get all the information and that you verify this for yourself. The next step is to begin your training on an entry level course in the subject are you wish to offer. We would advise you start with either A Levels or Accredited Level 3 Diplomas, these level of courses offer a good overall understanding of topics and provide a solid foundation on which to build your studies. Once enrolled on your first course, you just need to put the hard work and effort in to achieve your qualifications and keep going until you get fully qualified.